Performance artist Joseph Keckler provides some context for the nativity scene Jaimie Warren made for the VICE photo issue 2014. Jaimie Warren made this photograph for the 2014 VICE photography issue. We asked performance artist Joseph Keckler, who plays Freddy Krueger in the picture, to provide us with a little more context for Jaimie's work. Photographer and performance artist Jaimie Warren has transformed herself into many vivid entities, icons she summons from the collective unconscious and then twists: a sybaritic version of the Hindu goddess Kali who smokes joints from each of her eight bejeweled blue hands; a heaping plate of lasagna that is also the head of Lana Del Rey; a ravenous Freddy Krueger and the screaming meatball he impales, plucks from a pizza, and gobbles up. Warren revels in visions of excess as she playfully depicts and becomes the things we devour and the figures we fear will devour us. Similarly, Warren’s work possesses several qualities that are, at this moment, both enticing and a bit scary to the contemporary art world. It is amusing, pleasurable, theatrical, festive, declaredly collaborative, crafted but not slick, and approachable yet strange. Her affection for popular culture is not tempered by any sense of superiority. On the contrary, like many of her generation, Warren has suggested that pop culture has inspired her more than contemporary art. In her recent solo exhibitions at the Hole, The Whoas of Female Tragedy (2013), and That’s What Friends Are For (2014), Warren showed work from several ongoing series: Art History, Celebrities as Food, Totally Looks Like, and Horror Movie GIFs. In the Art History series, Warren photographs her own staging of classical paintings, a strategy famously employed by self-portraitists Cindy Sherman—the artist to whom Warren is most often compared—and John Kelly, as well as Robert Wilson, and others. Perhaps resonating as much with Mike Kelley’s work as with Sherman’s, Warren’s series incorporates musical numbers, aspects of autobiography, religious pageantry, a scrappy visual aesthetic, and a keen sense of the ridiculous. 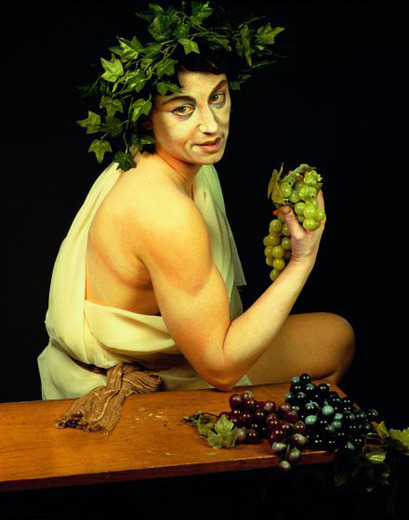 In the Celebrities as Food series, Warren also calls on the internet, selecting images from two popular websites dedicated to these pun-driven collages—where, for instance, Fred Savage and a cabbage are digitally merged to become a new incarnation called “Fred Cabbage”—and then recreating the images by using painted backdrops, makeup, costumes, and her own body. Through translating such 2-D amalgamations into physical space, Warren performs a ritual of undigitization. The final portraits deliver a sense of texture that is often pleasurable and sometimes visceral—a pool of marinara that oozes out from under the noodly chin in Self-Portrait as Lasagna Del Rey doubles as blood, bringing to mind Solario’s Head of John the Baptist, filtered through the memory of Pee-wee Herman. Treating pop culture as a fluid mythology, Warren plays with its personae the way a kid plays with action figures at home. Universes are mixed, meaning that Marvel and DC, Barbies, Furbies, and a clothespin with googly eyes can all interact—no problem. Characters may enter new circumstances and adopt different dimensions, motives, and identities. 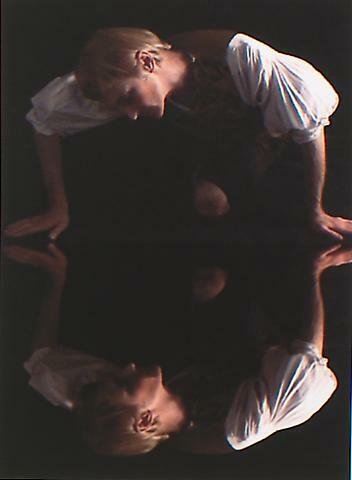 In the video that accompanies this article, a document of Warren’s recent performance at the Hole, the artist emerges as a tormented Freddy Krueger, a premiere villain of the 1980s who appeared in Nightmare on Elm Street, hunting his victims in their dreams as well as in the physical world. In Warren’s scenario, Freddy decapitates a sprightly, unthreatening figure that tiptoes towards him. He hurls a ceramic vase to the floor, and intermittently screams in anguish, possibly horrified, at last, by his own cruel nature. In short order, he is joined by a zippy gang of back-up dancers—composed of three more Freddy Kruegers, as well as a pair of Freddie Mercurys—and makes an imploration via karaoke, belting Queen’s “Somebody to Love.” The decapitee returns for a guitar solo. Krueger’s plea is answered in no time; the comforting harmonica melody of “That’s What Friends Are For” wafts through the room as Stevie Wonder appears. Several LEDs glow with the light of redemption as Wonder helps Freddy miraculously transform into… Michael Jackson! Freddy/Michael expresses teary gratitude toward Stevie and proceeds to dance to “Black or White,” along with the gang. Such a metamorphosis feels radical, but more surprising are the many features Jackson and Krueger share. Both have one gloved hand and don a black fedora, as Warren highlights within the performance. Both have faces that have been extremely altered. Also, Wes Craven has said he first conceived Freddy Krueger as a child molester. And in the realm of nightmares, rumors and accusations of child molestation bedeviled Jackson. I had only met Jaimie Warren once, briefly, when she wrote to ask me if I myself wanted to play Freddy Krueger in one of her Art History pieces, being shot for the photo issue of VICE. She greeted me outside of her Bushwick home/studio in a USA World Cup ’94 T-shirt and what appeared to be a Bozo the Clown wig. She offered me snacks and led me into a basement, where others were already making up to be a part of the photo. We were to recreate a Bohemian nativity scene painted by the Master of Hohenfurth in 1350, but with horror-movie villains. “Let’s choose a safeword,” said one of the three. “How about tampon?” offered another. “Good,” said Warren. She assumed her position in the center of the scene and continued giving directions, which were now severely muffled by the crooked fangs in her mouth. Portraying Pennywise, the evil clown from Stephen King’s It, she inhabited the position of the Virgin Mary, reclining in a bed with her newborn. And whom did she cradle, in the place of Baby Jesus? The blob, of course. An alien being with no eyes, ears, or skeleton, who consumes every human it can. In Warren’s world, the new messiah is a hungry, black pile of goo: a living appetite. Joseph Keckler is an interdisciplinary artist, writer, and operatic bass-baritone whom the Village Voice named “Best Downtown Performance Artist" in 2013. Follow him on Twitter.